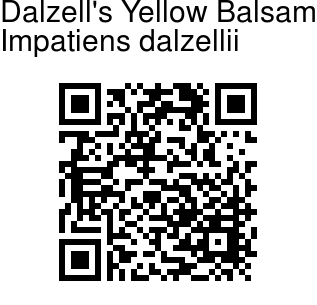 Dalzell's Yellow Balsam is easy to identify as it is the only yellow Balsam found in the Western Ghats. It is an annual herb, growing to 1-1.5 ft tall. Stem are erect, succulent, swollen at the nodes. Alternately arranged broadly lance-shaped leaves, 5-12 cm long, are pointed and have serrated margin with spines in the teeth. Base of the leaves is heart-shaped. While the lower leaves have a short stalk, the upper ones are stalkless. Yellow flowers occur singly in the upper leaf axils. They are 1-1.5 cm across. Sepals are linear and the standard petal is hooded, winged on the back. Lip is boat-shaped, streaked with red veins. The spur is short. Capsules are 1- 1.5 cm long. 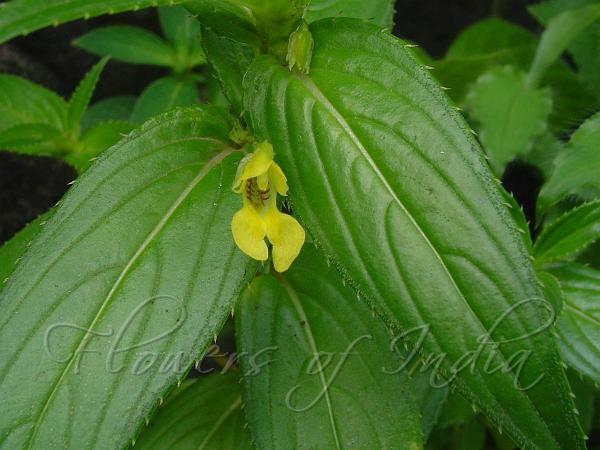 Dalzell's Yellow Balsam is endemic to Western Ghats. Flowering: August-October. Identification credit: Prashant Awale Photographed at Lonavala, Maharashtra.